Title Sainte / Bible / Traduite / sur les Textes / Origineaux, / avec les différences de la Vulgate: / Nouvelle Edition / Revue, & augmentée des Concordances, Tables / Chronologiques, & quelques Notes. / Tome I. 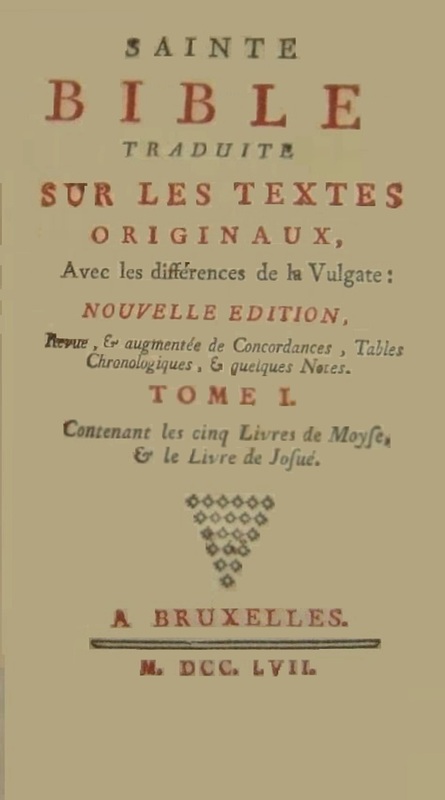 / Containent les cinq Livres de Moyse, / & le Livre de Joshue / A Bruxelles. / M. DCC. LVII. Contents: A seven volume edition containing the translation by Nicholas le Gros through Ezra and by unknown other parties for the remainder. The original edition appeared in five volumes in 1753. Comments: In 1739 le Gros had published an edition of the Bible with his translation through Numbers 22:23 and the Port Royal translation for the remainder.